The 11th Circuit decision last week was the most significant court ruling to date in the constitutional challenges to ObamaCare, and it virtually assures a U.S. Supreme Court hearing, most likely in the coming term. The judges decided 2-1 that it is unconstitutional for Congress to compel citizens to purchase health insurance, in an appeal of the case brought in Florida by 26 states and the National Federation of Independent Business. Earlier, a 6th Circuit Appeals court ruled in a separate challenge that the mandate is constitutional. Several more cases are pending, but the split in the two appeals court decisions tees it up for resolution by the Supreme Court. If the individual mandate is upheld, the next step surely will be requiring that we all purchase ObamaCare’s long-term care insurance, especially since Health Sec. Kathleen Sebelius has acknowledged that program is “totally unsustainable” now. And the court didn’t buy the government’s argument that the mandate is constitutional because Congress needs it for other provisions in the law to work. And the court made it very clear that it finds the law enormously complex. 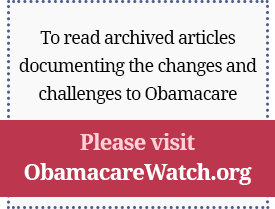 “…to know whether a legislative act is constitutional?our task is to figure out what this sweeping and comprehensive Act actually says and does.” The 304-page decision devotes a total of 35 pages to describing what ObamaCare does — no small feat. It’s a penalty, not a tax. Not one of the courts which so far has ruled — no matter what the decision — has agreed with the Obama administration that the penalty for not buying insurance is really a “tax.” The government thinks calling it a tax is its home-free ticket. It’s unlikely to work. “It is not surprising to us that all of the federal courts, which have otherwise reached sharply divergent conclusions on the constitutionality of the individual mandate, have spoken on this issue with clarion uniformity. Beginning with the district court in this case, all have found, without exception, that the individual mandate operates as a regulatory penalty, not a tax,” the 11th Circuit wrote. The court severed the individual mandate, but that doesn’t mean the rest of the law is constitutional. News reports have said that because the 11th Circuit didn’t throw out the whole law, the rest of it is constitutional. WRONG! What the judges said was that they were not willing to go as far as U.S. District Judge Roger Vinson did in ruling that, if the individual mandate is unconstitutional, the whole law must fall. “Because the individual mandate is unconstitutional and not severable, the entire Act must be declared void,” Judge Vinson concluded. The 11th Circuit disagreed. There are many other provisions in the law which are being challenged individually — including the legality of the Independent Payment Advisory Board, and there are other potential challenges, including the government’s authority to force employers to provide insurance or pay a penalty. The court did not address those issues. The decisions cannot be attacked along partisan lines. Judge Jeffrey Sutton of the 6th Circuit was appointed by President George W. Bush and voted to uphold the individual mandate. In this 11th Circuit decision, Judge Frank Hull, appointed by President Clinton, voted to declare the mandate unconstitutional. The perspective of the law’s backers. Finally, we see a consistency among those who have concluded that the individual mandate is constitutional. In his 11th Circuit dissent, Judge Stanley Marcus repeatedly says that health care is uniquely important, that everyone will need it, and that it is therefore within the purview of Congress to regulate this form of commerce. The real question in all of these decisions is whether or not the U.S. Supreme Court will use this case to finally put the brakes on the expansive use of the Commerce Clause to regulate all forms of commerce and our behavior as we engage in that commerce. As with so many other issues in this historic debate, it ultimately all comes down to freedom — and whether it will be lost or preserved pending decisions by the Supreme Court and the voters next year. ObamaCare: Many people claim that the shorthand term we use for the Patient Protection and Affordable Care Act — ObamaCare — is derogatory. The president was asked about the term “ObamaCare” this week during his Midwest bus tour. But later, he seemed to be tinged with regret over his signature law. Puzzling? I think not. Just listen to the judges. At FreedomFest in July, Reason’s Nick Gillespie talked with Grace-Marie Turner of the Galen Institute about Why ObamaCare Is Wrong for America. Washington is as polarized as ever, but there is one area of growing bipartisan consensus: Lawmakers on both sides of the aisle are coming together to oppose a controversial board created by last year’s health care overhaul law. The Independent Payment Advisory Board was created to take difficult decisions about cutting Medicare spending out of the hands of legislators and give the powers to a panel of appointed, independent experts. If left in place, the IPAB will have the power to stifle innovation and harm seniors’ access to medical care. There’s little doubt that IPAB will fail. As lawmakers look for ways to make Medicare sustainable for the future, they can look to the Part D model of competition and choice. IPAB stands for everything that is wrong with ObamaCare — taking power away from doctors and patients and putting it in the hands of elite experts who have virtually no accountability to patients or voters. It will have power over hundreds of billions of dollars in spending with little or no accountability to voters. And their approach to holding down Medicare spending will certainly default to making deeper and deeper reductions in payment rates to providers that will threaten access to care for seniors. Grace-Marie Turner participated in a debate earlier this month before the Colorado Health Foundation’s annual meeting in Keystone, Colorado. Len Nichols, T.R. Reid, Jon Caldara, and Grace-Marie debated whether or not the Affordable Care Act should be repealed and new approaches to health reform explored. In a piece reporting on the debate for Health Affairs, she argued that while we do need health reform, the ACA builds on dysfunctional systems in both the private and public sectors, and will cause a cascade of negative consequences. The debt crisis is a health spending crisis, plain and simple, and real change will take much longer. Government spending on health care entitlements will bankrupt this nation unless we reform these programs. And ObamaCare’s new entitlement programs will make the problems much, much worse. ObamaCare uses Medicare reimbursement as an incentive to create accountable care organizations (ACOs), which the federal government has decided are the way to deliver quality care at lower cost. Proposed regulations by CMS are largely confusing, impenetrable, and inconsistent. They give CMS detailed control over ACOs and the providers who participate in them, including censorship of ACO communications with Medicare beneficiaries. CMS’s effort, launched by ObamaCare, to use the leverage of Medicare reimbursement to impose and control a favored model of health care delivery is bound to fail, but only after increasing the angst of providers and patients and dissipating large amounts of resources — money, time, and brainpower. It blocks the development of other ideas for reforming health care delivery. ACOs are fatally flawed and cannot be fixed by merely changing the proposed regulations. Will Health Care’s Long Boom Go Bust? Health Spending Projection Spin Cycle: Rinse And Repeat, Or Reset? Can ObamaCare Survive an Unconstitutional Mandate? Where’s Your Budget, Mr. President? Is Medicare More Efficient Than Private Insurance? Grace-Marie Turner will participate in the “Fixing Medicare and Strengthening America: A Health Care Reform Toolkit” panel at 9:10am on Saturday, August 20. Medicare Part D Drug Benefit: Five Years Later–Is It Working? Our new book, Why ObamaCare Is Wrong for America, will be on sale at this event.